584 backers pledged $31,206 to help bring this project to life. Do you and your adventuring party have what it takes to survive the Abandoned Kingdom of Algarus? Find out in this co-operative role-playing game (RPG) where you and your friends will team up to battle monsters, evade traps, and challenge fearsome bosses at the end of each of the 3 chaotic levels! And as a thanks for stopping by, have a free mp3 download of our theme song: Unsealed Fate by Jon Babb! Random Encounters is a game for 1-4 players, ages 13 and up and takes 20 minutes per player to experience. No DM Required - In this adventure it's the players VS the deck of Encounter cards. Just open the box and your quest is ready to begin. New Player PRESS START - Did someone show up late to game night? That's fine! Players can leave in and out of the group as the adventure goes on, like an arcade beat 'em up! Gateway RPG - Random Encounters takes influence from both tabletop and digital role-playing games in order to create a streamlined adventure that is perfect for those new to RPGs or board games. Follow the Leader - Each character has a special ability that activates when they are the leader of the group. During one encounter the party may get a defense boost, a sneak peek at the upcoming loot, or even a second chance to roll their dice! A New Path Appears - With 75 encounters cards, 75 loot cards, and 9 bosses spread across 3 levels; each game provides a different experience. Will you you battle the Great Golem or the Lord of the Jellies? Is that really a treasure chest - or a mimic!? This project has been developed over the past two and a half years by Joshua Garrett (design, colors) and Jordan Basaldua (illustrations, design). We're just two regular people that love games and have learned how to use Photoshop by watching YouTube videos and reading books so that we can design the cards and create the artwork ourselves. We've play-tested Random Encounters at comic and game shops, conventions, and of course - the dining room table! We're just about to finish the artwork (about 15 out of 175 unique images to go) and we're confident that with your help we can get Random Encounters created. If we can hit our goal, then together we can afford to get Random Encounters printed, boxed, and shipped all over the world! 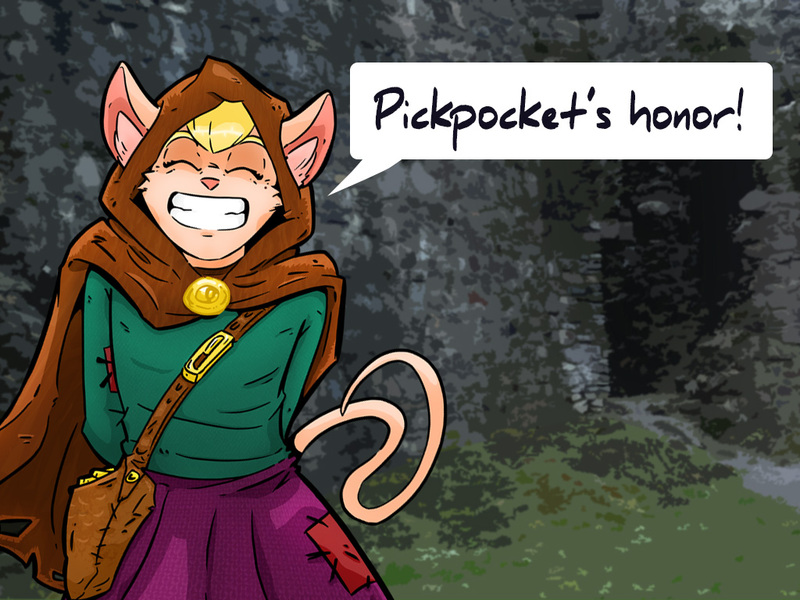 Those familiar with RPGs will have no trouble picking up Random Encounters - but the same goes for those who haven't! We have playtested this game with gamers and non-gamers alike with ages ranging from 9 to 65, all of which were able to grasp the rules with little difficulty. We also have just finished a tutorial video! You can also watch this demo video where we'll teach you how to play Random Encounters while exploring the first level. We also have a retail tier! For the moment, we only offer the retail package to stores in the U.S. (sorry)! If we hit our goal and are able to get the game printed, Ship Naked will be helping us deliver Random Encounters all over the world! They are pros when it comes to delivery and have been super helpful in teaching us how we can effectively get this game to you. By using their Customs-Friendly World Wide Shipping, you as a backer don’t have to worry about getting slammed with a surprise charge for importing a game. We absorb the cost of shipping Random Encounters into the total price, but do ask backers outside of the U.S. to pay the difference. But we hope that you’ll find the prices to be pretty decent! $15: The rest of the world! If we are able to earn MORE than our initial goal, then we can unlock Stretch Goals. These are additional bonuses to make the game even better. ALL copies of Random Encounters will come with ALL Stretch Goals. Thanks for stopping by our page! Please consider sharing it with your friends so that together we can make this dream journey a reality! We are not interested in finding a publisher, or any other offers to take a percentage of our gracious donations in exchange for exposure. All such offers will be ignored and frankly, we will be disappointed in you for sending them because that means you didn’t read our page and weren’t all that interested in the first place! Those violating this request will have to deal with the Manticore, and we are not responsible for the Manticore’s actions. We believe the risks involved with backing Random Encounters are fairly low. While this is our first project, the game has already been developed - it just needs manufacturing and shipping once we finalize the last few pieces of art. However just like any journey, there might be bumps along the way and something can always go wrong. Please know that you are not supporting a product, you are supporting an idea; together we can bring that idea to life! You get the ability to vote on backer polls (like helping choose bonus characters) and get backer-exclusive updates. You can always increase your pledge later if you decide you want to get the game! You'll get a link to download a Digital Art Book featuring concept art, early card designs, and development notes. Also includes voting ability and backer updates. One copy of Random Encounters shipped to your door! Also includes digital art book, voting ability, and backer updates. One copy of Random Encounters shipped to your door and a signed card from one of our Random Encounters prototypes. Also includes the digital art book, voting ability, and backer updates. You will get one of the original sketches used to create Random Encounters plus one copy of Random Encounters shipped to your door! Also includes a signed prototype card, digital art book, voting ability, and backer updates. Get 3 copies of Random Encounters. If you would like to order more than 3 copies, add $30 for each additional copy to this reward level. [Example: 5 copies = $99 + $60 + Shipping (if applicable)]. Get 5 copies of Random Encounters, including all stretch goals. Suggested MSRP: $40. Must have Sales Tax ID to order. If you would like to order more than 5 copies, add $20 for each additional copy to this reward level. [Example: 7 copies = $119 + $40 + Shipping (if applicable)]. Get a name of your choice involved in the lore! The name will be written in the flavor text on a card (no nastiness or copyrighted characters. We have final approval. Email us with the name you want to submit BEFORE you pledge)! You will also get a matching prototype card and the original sketch from that card. Get a LOOT card named after you (or a name of your choice)! The name will be written on the top of the card (no nastiness or copyrighted characters. We have final approval. Email us with the name you want to submit BEFORE you pledge)! You will also get a signed matching prototype card and the original sketch from that card's art. Get yourself (or a loved one or your original character) made as a Character Card in Random Encounters! We will work with you to create a design that fits the world of Random Encounters. No nastiness or copyrighted characters will be accepted. Please message us BEFORE you pledge this tier! We have final approval. Also comes with one copy of Random Encounters, the original sketch of your character, a signed prototype card, digital art book, voting ability, and backer updates.